Immigration activists in the Northwest are pushing for Congress to get beyond the government shutdown fight and return to the issue of undocumented workers. Immigrant rights groups rallied in Yakima, Wash., on Saturday as part of a national protest. 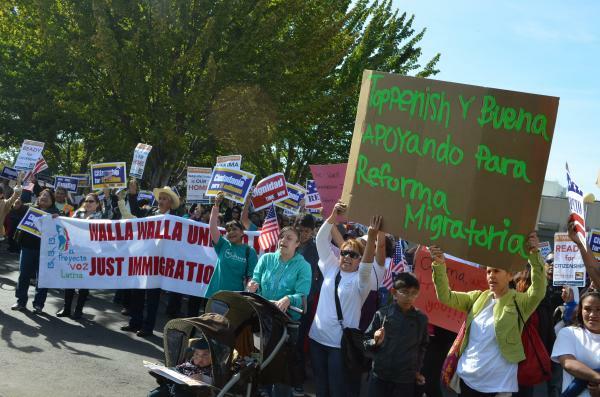 Flags were waving as caravans of people pulled into Yakima to rally in front of the office of Republican Rep. Doc Hastings. "This is not about a political rally," said Enedo Garza, a pastor in Toppenish, Wash. "This is about dignity. This is about people." Garza is one of the more than thirty pastors who helped to organize this event, long before the most recent controversies in the nation’s capitol. "We pray for what’s happening in Syria, it is important," Garza said. "We are praying for the shutdown of the government because it is important. But this is important also. And they have to understand that this is something in our agenda and it has to be part of their agenda too." Garza and others are hoping this rally will pressure Hastings to vote in favor of an immigration overhaul. Hastings has said that the Senate immigration bill, which passed in July, needs a number of improvements before it can move forward in the House.